Be the first to share your favorite memory, photo or story of Alex . This memorial page is dedicated for family, friends and future generations to celebrate the life of their loved one. 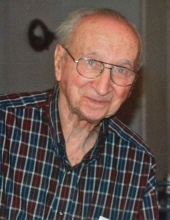 Alex Sadoway Age 96 passed away on February 2, 2019. Loving father of Sandra (Bill) Jack and David (Kathleen) Sadoway. Cherished grandfather of four and great-grandfather of 10. Alex will also be missed by his many nieces, nephews and friends. Visitation Monday 6:00 p.m. to 8:00 p.m. with 7 p.m. Prayers at St. John Armenian Church. In state Tuesday 10:00 a.m. until Alex’s 11:00 a.m. Funeral Service. Memorial contributions to St. John Armenian Church or The Detroit Goodfellows. To send flowers or a remembrance gift to the family of Alex M. Sadoway, please visit our Tribute Store. Memorial Luncheon to follow Funeral and will be at church. "Email Address" would like to share the life celebration of Alex M. Sadoway. Click on the "link" to go to share a favorite memory or leave a condolence message for the family.